Resicast recently re-released a retooled version of the Model T Ford Vickers MG carrier 1916, which I reviewed here on site a short time ago. To go with the new vehicle they have also released a new driver dressed in cold weather clothing to go with the vehicle. The figure was sculpted by Gerard Detroeye and the painting for the colour reference was done by Christophe Nachtergael. The figure comes packed in the standard Resicast format of a double ziploc plastic bag with a coloured card insert. The card displays the company and product details and contains a colour photograph of the painted figure for reference. The expertly cast figure is cast in a light coloured resin and consists of three parts. 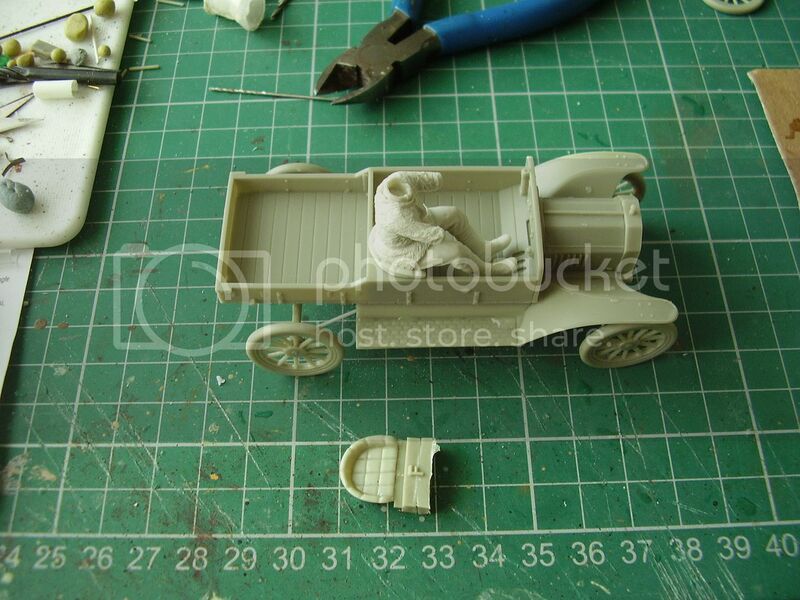 The body and upper arms are cast as a whole, the lower arms are cast holding the car steering wheel and to complete the figure you have a separate head. The figure is dressed in a cow hide coat. Around the waist is a leather belt and the remainder of the uniform consists of tunic trousers, long putties and ammo boots. The detail of the coat looks good and the figure should pain up well. The trousers, putties and ammo boots are all well detailed. Attached to the backside of the figure is a replacement seat for the vehicle and you get the two lower arms that come attached to a steering wheel. The wheel and gloved arms are nicely done, the gloves are of the long driving type. The head a separate item comes with the sides of the forage cap pulled down and fastened under the chin. Driving goggles cover the eyes and the cap has a nice cap badge in place plus the leather strap and side buttons. Another useful figure form Resicast. Made for a specific use, driving the Ford T, I will have to see if a little alteration would make him suitable for the RR as well. Having figures to drive or crew you vehicle is I believe a real plus. They help add scale and interest. The simple make up of the figure means you can get to the fun part quickly. I have enclosed some images courtesy of Gerard of the figure in progress. Highs: Simple construction with excellent detail. Thanks for the review Alan. One major low comes to my mind immediately and that is this figure is very vehicle specific. No ... we are not burdened with a huge choice of WW1 vehicles either, but it would be nice to be able to use this guy with other vehicles, like the rolls royce as you mentioned. Im surprised they modelled him in the Ford T seat. This might have been as easy to model him without the seat, but fit it? On the other hand, it is a beautiful figure and I can imagine it would look great posed in the vehicle its meant for. Id almost conider buying the ford T and this figure just to pose them together. Looking forward to more progress shots from both subjects. WW1 is seomthing that is growing on me a lot! !